The major attraction for this day or weekend getaway is William Randolph Hearst's "Castle," now California's most popular state park. This astounding architectural concoction offers a view into the lifestyle of one of the richest men of his time. You can plan your Hearst Castle day trip or weekend getaway - quick and easy - using the resources below. Why Should You Go? 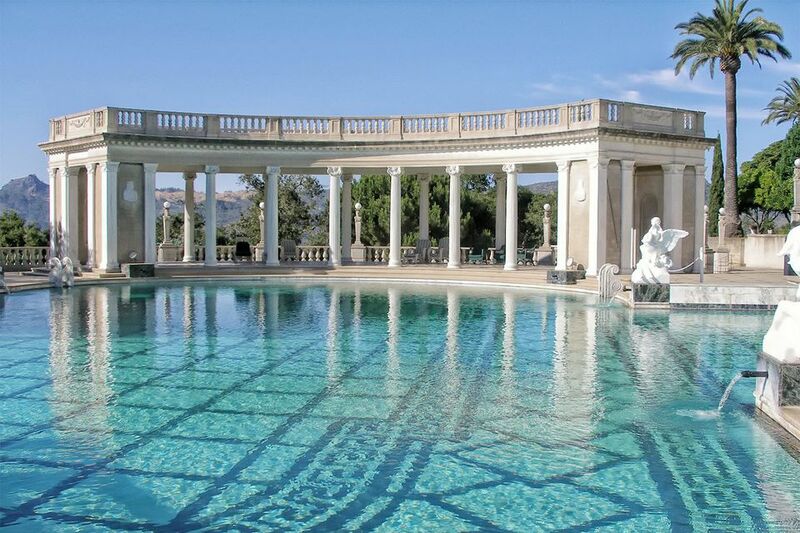 Will You Like Hearst Castle? Hearst Castle attracts the star-struck and celebrity-seekers, especially if they are into movie stars of early Hollywood. Fans of architect Julia Morgan may also enjoy this place. Hearst Castle is busiest in summer when vacationers drive up hotel prices and pack the tours. Buy your tickets well in advance if you're visiting then. The castle grounds look best in spring and fall, when the gardens flourish, skies are clearer, and you can take a night tour. The non-air-conditioned house is also cooler inside. Because the main attraction is indoors, you can visit anytime, even in the rain. Hearst Castle is decorated for Christmas every year from mid-November, and in winter, you may see the elephant seals in action at nearby Piedras Blancas. Tours of the classic Piedras Blancas Lighthouse are given once a month. The elephant seal rookery, right on Highway One about 4.5 miles north of Hearst Castle is most interesting during the breeding season, from December through February. You can also take a side trip to nearby Cambria, Cayucos, and Morro Bay. ​All three of these seaside communities have a laid-back ambiance and beautiful coastal views. On a busy day, tours can sell out quickly, and if you arrive in the late morning, you could end up waiting until late in the day (or even the next morning) to take one. Buying tickets in advance will help you avoid this problem. Tours last about two hours but allow almost a half day to take the tour, see the film, browse through the exhibits and do a little shopping in the gift shop. In rainy winters, landslides can sometimes close CA Hwy 1 north of Hearst Castle, making it impossible to reach if you're traveling south from Big Sur. Check road conditions online or call 800-427-7623 or 916-445-7623 before you go. Pets are not allowed on tours, you can't leave pets in your vehicle and kennels are not available. The town of San Simeon is closest to the Castle and offers some nice places to stay if you're spending all your time at the castle, but is otherwise unremarkable. Within a half hour's drive, you can find a place to stay in Cambria, Cayucos or Morro Bay, all of which are better places to base a weekend getaway. If you're traveling in an RV or camper - or even a tent - there are a number of Hearst Castle area campgrounds. You can't stay overnight at Hearst Castle, but you can bunk down at Hearst's Hacienda near King City and the tiny town of Jolon. That's a bit of a drive from the castle. Make a two-day trip out of your visit by stopping at the Hacienda on Friday night, then head over the mountains to the coast and visit Hearst Castle on Saturday. ﻿Read guest reviews and compare prices on area hotels at Tripadvisor. Hearst Castle is 250 miles from Los Angeles or San Francisco, 320 miles from Sacramento, 93 miles from Monterey and 455 miles from Las Vegas. It's located on U.S. Highway 1, 35 miles north of Morro Bay. If you're driving north on U.S. Highway 101, exit onto U.S Highway 1 North of San Luis Obispo. Going South on U.S. Highway 101, exit at Highway 46 near Paso Robles and take it to U.S. Highway 1, then go North.